The land currently under Department of Conservation (DoC) management makes up nearly a quarter of the whenua within Te Rarawa’s rohe. Many of our communities are in and around the conservation estate. The role Te Rarawa hapū play in the governance and management of this whenua is one of the most important aspects of the settlement package. The cultural redress includes a co-governance arrangement for Conservation land which is referred to as ‘Te Korowai’. Haami Piripi, Mandated Te Rarawa Negotiator explains the importance of the Conservation Lands and elements of the Korowai in the Deed of Settlement. _The name ‘Te Korowai’ refers to the concept of a cloak of protection, and is representative of the role that the hapū and marae of Te Rarawa undertake as kaitiaki of the whenua and taonga within the entire taiao, including the Conservation estate. The Korowai for enhanced Conservation provides a framework to recognise the historical, spiritual and cultural association Te Rarawa have with the Conservation lands within their rohe. Te Korowai gives Te Rarawa comprehensive input into decision-making including the protection of cultural taonga and ecological areas, and the utilisation of cultural resources. The implementation of the Korowai will be a collaborative process with Te Rarawa working alongside Te Aupōuri, Ngāi Takoto and Ngāti Kuri. It also ensures that Department of Conservation (DoC) decision-making, under the Conservation Act 1987 and Schedule 1 legislation, will occur in a framework in which Te Rarawa’s interests will be protected. an annual meeting with the Minister of Conservation. A new Te Hiku Conservation Board will be established with equal numbers appointed by Te Hiku Iwi and the Crown. The Board will have a number of statutory functions, similar to those of the Northland Conservation Board, including recommending the approval of a new Te Hiku section of the Northland Conservation Management Strategy, relating to public conservation land within the area covered by Te Korowai. 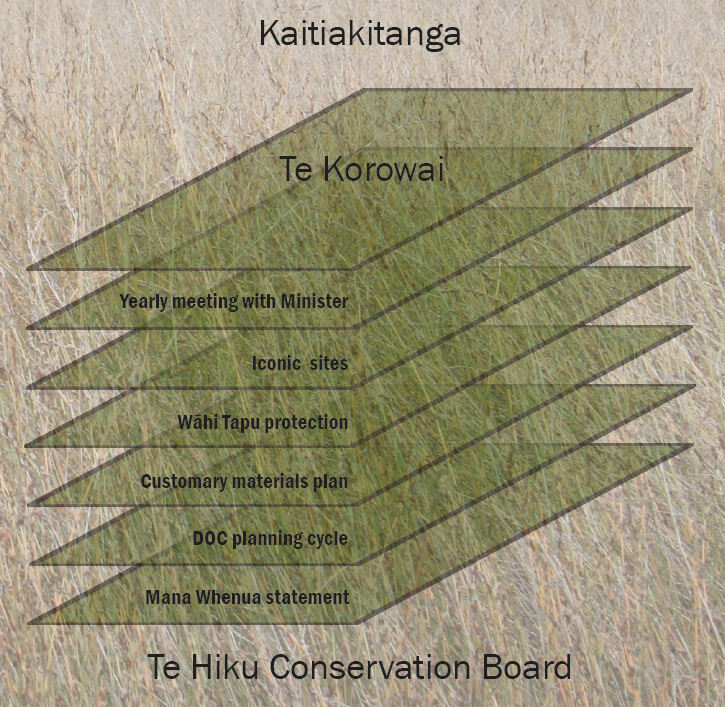 Te Rarawa as one of Te Hiku Iwi will co-author with the new Conservation Board the Te Hiku Conservation Management Strategy, to ensure that our priorities are included in this primary planning document. Te Rarawa will also engage at all levels of the regional and local Department of Conservation in order to ensure that the appropriate kaitiaki hapū are participating in conservation management within their respective areas. The settlement offer provides for a new relationship between Te Rarawa hapū and the Crown in Te Warawara, for joint management and governance roles. It acknowledges the mana whenua of the kaitiaki hapū and creates a platform for hapū kaitiakitanga alongside Crown conservation. This agreement named Warawara Whenua Ngāhere i te Taiao will enable a kaitiaki rōpū made up of the surrounding marae to work in a collaborative relationship with Department of Conservation to develop management and operational plans and to make decisions on concession applications. A Te Hiku-wide customary materials plan will be developed by Iwi. Once this plan has been completed kaitiaki from each area will have decision-making power over applications from Iwi members for customary materials, gathering of flora and possession of dead protected fauna. It is anticipated that all users of the Conservation estate will also abide by the plan. The plan will contain criteria and guidance on who, what, when, how and where customary materials can be gathered, obtained or possessed. Each Iwi will hold files identifying wāhi tapu sites and other general areas of cultural significance. Te Rarawa’s kaitiaki Iwi will have full management of these sites, including the ability to protect their sanctity and cultural values within the estate. The Department of Conservation will enter into formal management agreements in relation to wāhi tapu on conservation land which will affirm the kaitiaki and tikanga of these areas. In order to assess and evaluate the implementation of Te Korowai, an annual meeting will be held between Te Hiku Iwi and the Minister of Conservation. This will provide an opportunity to take a strategic long tem view, review the previous year’s work, and plan for the following year’s priorities.